November 22 2017 - Hodaya Asulin of the West Bank settlement Mevo Horon, succumbed to wounds sustained in a 2011 terror attack in Jerusalem. Hodaya Nechama Asulin (20), who was critically wounded in a 2011 terrorist attack in Jerusalem, died today (Wednesday, 22 November 2017) at Jerusalem’s Hadassah-Ein Kerem Medical Center. 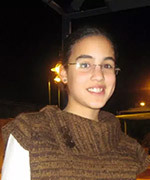 Hodaya, a resident of the West Bank settlement of Mevo Horon, was 14 when she was wounded in the attack in March 2011. She was waiting for a bus home at a bus station near the Jerusalem International Convention Center (ICC). A bomb hidden in a bag behind a telephone booth exploded, severely sounding her and killing a British national, 59-year-old Mary Jean Gardner. Dozens of people were wounded in the attack. In a coma since the explosion, Hodaya’s situation deteriorated over the past two weeks. She passed away early on Wednesday morning. Survived by her mother Michal, her father Eliyahu and six siblings, her funeral took place at Mevo Horon on Wednesday afternoon.